Sign up for free and just shop with Jacamo as normal. Our average member earns over £300 cashback a year. Jacamo cashback can be earned simply by clicking through to the merchant and shopping as normal. Jacamo Cashback is available through TopCashback on genuine, tracked transactions completed immediately and wholly online. You will not be eligible for cashback from this merchant if you have clicked through to them from a partner site (e.g. The Brilliant Gift Shop). To be eligible for cashback please ensure that any purchases are completed by clicking through to this merchant only. If you have been viewing this merchant from a partner site, you may need to delete cookies and clear your history in order for your transaction to track. Cashback may only be paid on the net value including VAT and additional services such as delivery. Jacamo - Any Occasion. Jacamo Fits. Get the latest leading-brand men's fashion and shop in style by making savings thanks to our top Jacamo promo codes and cashback deals. Browse must-have items such as coats, jackets, jeans, shirts and sports clothing for the man who likes to keep active and maintain good health in sizes ranging from small to 5XL. You will find popular brands such as Nike, Adidas, French Connection and Weekend Offender, as well as their own Flintoff by Jacamo collection of menswear. When it comes to footwear, you will discover Skechers, Timberland and Vans boots, shoes and trainers, while their range of accessories includes watches, sunglasses, hats and more. You can also search their outlet section if you are looking for great Jacamo discounts. Sign up to TopCashback using the form you will find at the bottom of this page and start saving. 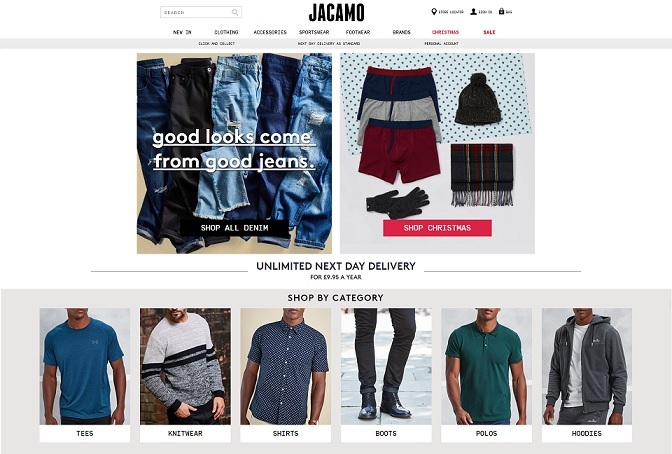 If you’re looking to shop Jacamo discount deals then the best way, additional to our cashback offers is to subscribe to their email newsletter, where you’ll hear about their sales first as well as new releases and other bonuses. Some of the biggest events on offer have ranges of lines with up to 70% off found in Summer, Easter and other times throughout the year. Some smaller sales, like the ones on Bank Holidays offer up 20% savings, and sometimes you can find the same discount offered on specific categories too. Multibuy deals are available additionally with the likes of two for £10 on tees and two for £35 on trousers, plus occasionally you will see, buy three get two mix and match offers. Any regular buyers can choose to make a saving on postage by opting to purchase the 12 month unlimited next day delivery for £9.95, or an even more tempting £4.95 if you happen to catch it on special. Whatever men's clothing products you buy, they offer a range of delivery and collection options. Order before 10pm and you can choose next day delivery if you are given the option during the checkout process, while delivery times are based on the assumption that ordered items are in stock. Nominated delivery will allow you to choose a day for your parcel to arrive which suits you, while you can order online and have your items sent to a Jacamo store for free, although this is not available with all items and you will be told before checkout if it is or not. When collecting from a Jacamo store, you will need to take the order acknowledgement email and a form of photographic ID. If you spend more than £40 (exclusions apply), you can have your order delivered to a myHermes ParcelShop, which are typically open from 7am to 10pm, seven days a week. You will need to take the PIN you will receive and a form of photographic ID when you collect your item. Get the latest trends from top brands at Jacamo and earn cashback rewards with these great deals. Browse must-have shirts, jeans and jumpers from big brands like Lambretta, French Connection, Voi Jeans and Flintoff by Jacamo, plus shoes and trainers from brands such as Rockport and Nike. With sizes from small to 5XL to order, they have fashionable and affordable menswear wrapped up. Buy coats, blazers and suits, nightwear, shorts and polo shirts. Their range of accessories includes bags, belts and jewellery, ties, watches and sunglasses. Shop for swimwear and sportswear, boots, sandals and flip flops.